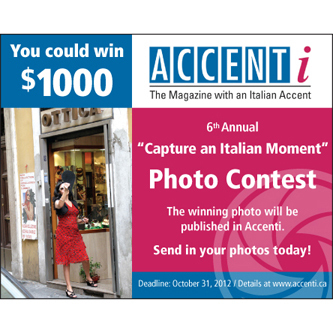 October 12, 2012 /Photography News/ The 6th Annual ACCENTI "Capture an Italian Moment" photo contest is now open for entries. This competition is open to photographers worldwide – professionals, amateurs, and students. (Non-Italians welcome – isn't there some Italian in all of us!). Multiple entries welcome. Submissions must "capture an Italian moment" anywhere in the world, but can otherwise be about anyone and anything.